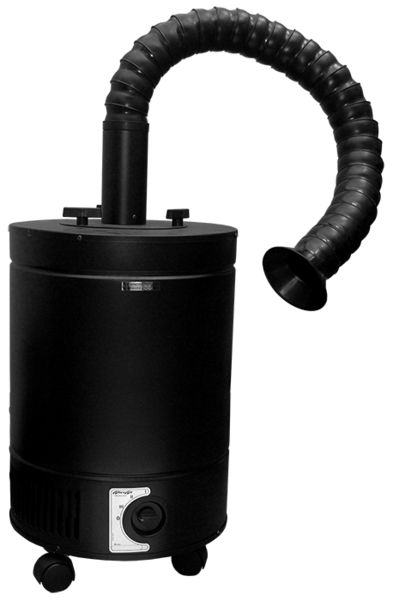 A Powerful, Portable Industrial Air Purifier that Quickly Captures Over 99% of Fumes, Dust & Particles Produced in Hair, Nail, & Beauty Salons, As Well as Art Studios & Hobby Shops or Wherever Pollutants Need to be Extracted at The Source, with 40 lb Carbon and 400 CFM or Optional 730 CFM Airflow, All at a Discount Price with Free Shipping! The AirMedic Pro 6 Ultra Salon unit is designed to treat very heavy concentrations of chemicals and odors in a confined space, such as a nalil salon, hair salon or other shops and workshops where fumes and dust are an issue. The "Ultra" option offers an extra-large, extra deep-bed 5" thick carbon filter for maximum adsorption of airborne toxins, a Super HEPA filter for particles and an easy-clean pre-filter. The standard unit comes with 40 lb of quality VOCARB industrial carbon that adsorbs more than 150 chemical fumes, including formaldehyde, benzene, and many more. The standard motor provides 400 CFM; if smoke is being generated in the shop or extra heavy chemicals, we recommend the 730 CFM motor upgrade for faster capture of those chremicals and smoke. The unit can also serve as a room air purifier by simply removing the arm and allowing the unit to run continuously in the space. This is unit an excellent choice for salons, offices, workshops, laboratories & medical applications and more where heavy chemical odors, solvent fumes, paint or glue fumes, or fine particles are present. With solid steel construction, long-lasting heavy duty filters and a full 10 year warranty, the Pro 6 Ultra Salon air cleaner is a winner. Order your AllerAir AirMedic Pro 6 Ultra here at a discount online sales price and feel the difference a real air cleaner can make. There are not many official online retailers of AllerAir air quality products and unfortunately the internet is full of scams. As a general rule of thumb, if the deal seems too good to be true, it probably is. Cheap cut rate online deals often end up being a used or refurbished unit, which do not come with AllerAir's top rated 10 year warranties. Or even worse, you may end up buying a cheap discount air cleaner that doesn’t have the energy efficiency, features or real air cleaning power provided by top-rated AllerAir air filtration systems. When you buy your money and energy saving AllerAir air filtration products from us, you get a brand new unit, at the best possible price, with AllerAir's amazing 10 year warranty. Our innovative partnership with AllerAir allows us to ship directly from their warehouse, which cuts out the middle man and eliminates the high operating costs of traditional brick and mortar big box stores. These savings get passed directly to you, allowing us to offer brand new allergy and asthma symptom-eliminating AllerAir air purifiers and filters at the best possible everyday cheap discount online sales prices. And buying from us is definitely better than direct. If you buy direct, you'll have to pay shipping. Buying from us, however, you always get fast free ground shipping as our thanks to you for shopping with us.